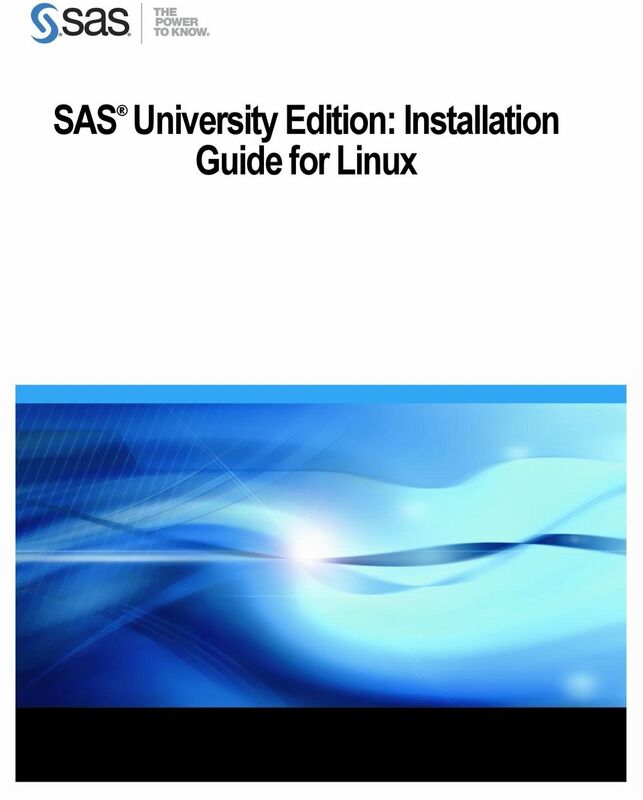 Download "SAS University Edition: Installation Guide for Linux"
4 Chapter 1: Requirements The following requirements are needed to run SAS University Edition: The SAS University Edition virtual image downloaded to your local system X86 64-bit hardware One of the two following virtualization software programs: VMware Player version 6.0 or later. You can download VMware Player 6.0 from re_player/6_0 PLAYER-602 product_downloads. 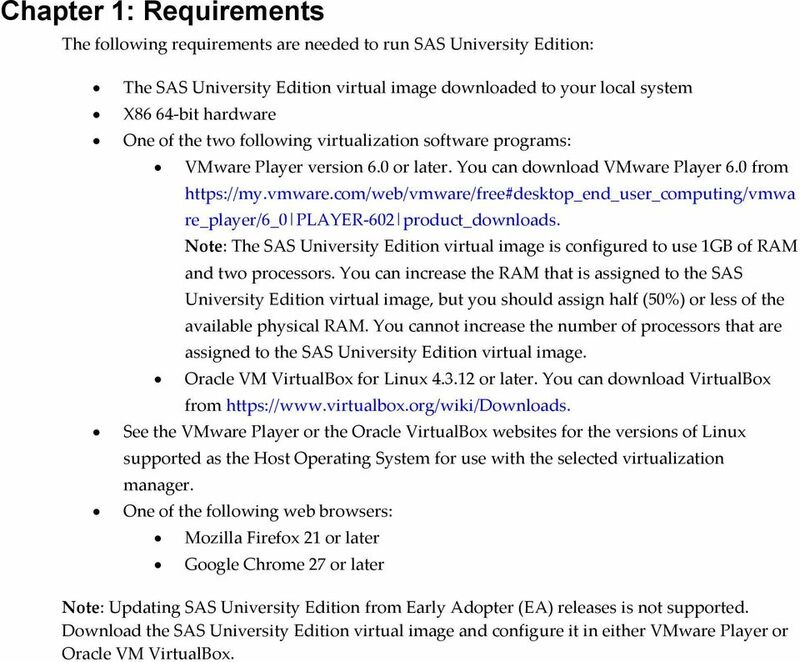 Note: The SAS University Edition virtual image is configured to use 1GB of RAM and two processors. You can increase the RAM that is assigned to the SAS University Edition virtual image, but you should assign half (50%) or less of the available physical RAM. 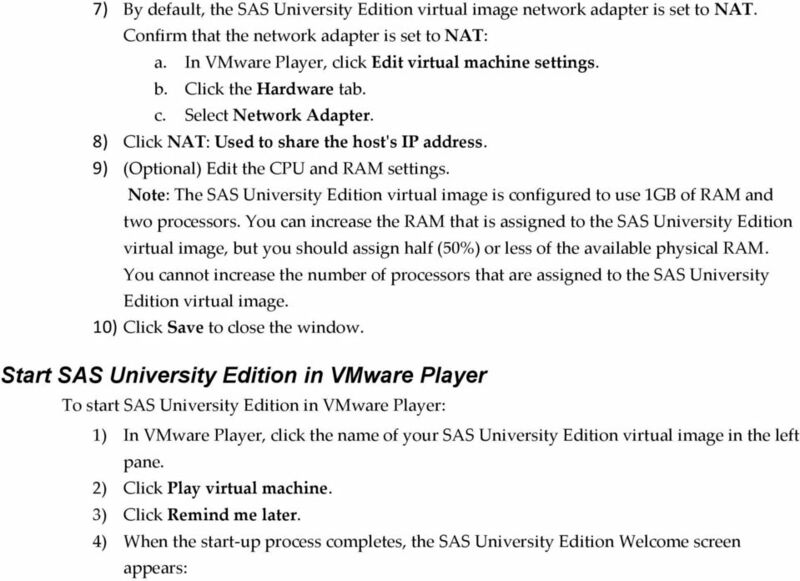 You cannot increase the number of processors that are assigned to the SAS University Edition virtual image. Oracle VM VirtualBox for Linux or later. You can download VirtualBox from See the VMware Player or the Oracle VirtualBox websites for the versions of Linux supported as the Host Operating System for use with the selected virtualization manager. One of the following web browsers: Mozilla Firefox 21 or later Google Chrome 27 or later Note: Updating SAS University Edition from Early Adopter (EA) releases is not supported. 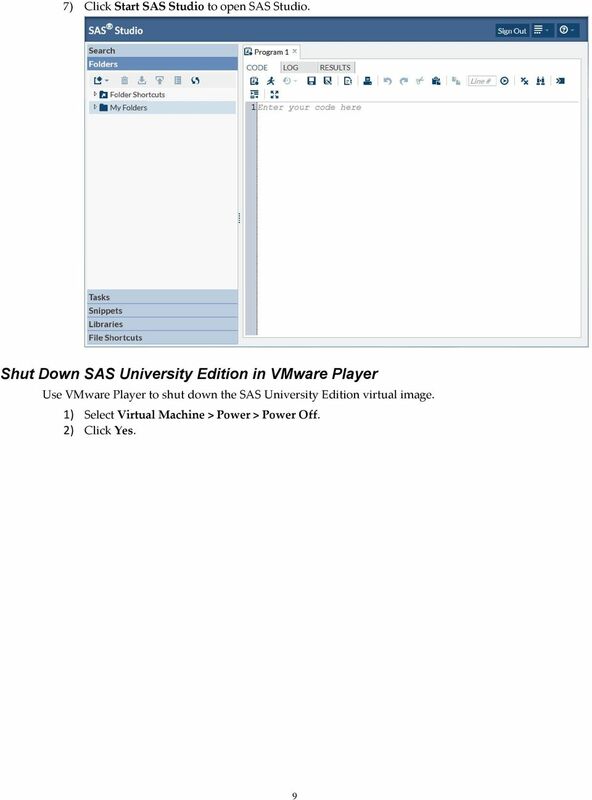 Download the SAS University Edition virtual image and configure it in either VMware Player or Oracle VM VirtualBox. 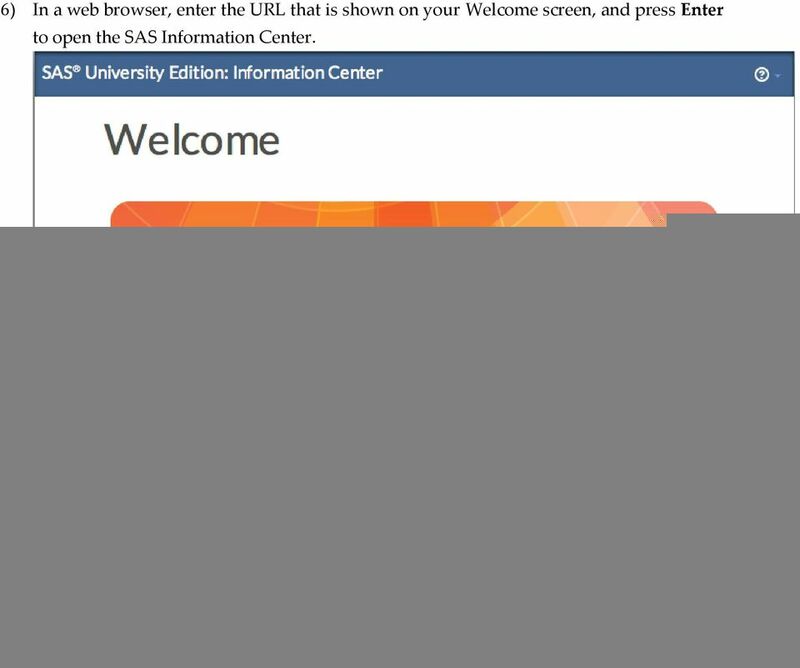 8 6) In a web browser, enter the URL that is shown on your Welcome screen, and press Enter to open the SAS Information Center. 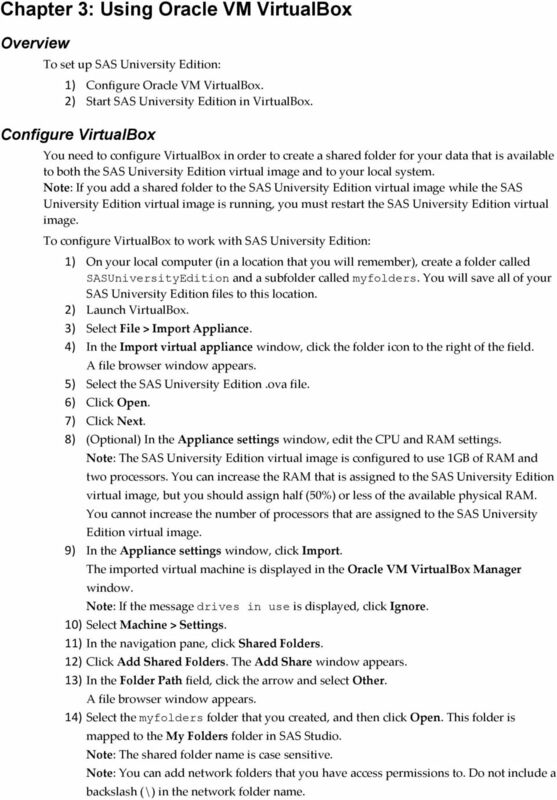 10 Chapter 3: Using Oracle VM VirtualBox Overview To set up SAS University Edition: 1) Configure Oracle VM VirtualBox. 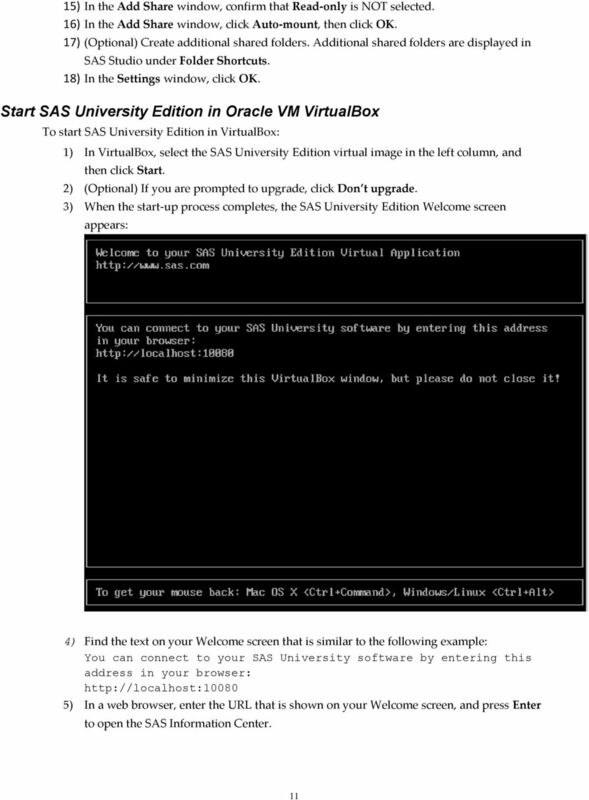 2) Start SAS University Edition in VirtualBox. Configure VirtualBox You need to configure VirtualBox in order to create a shared folder for your data that is available to both the SAS University Edition virtual image and to your local system. 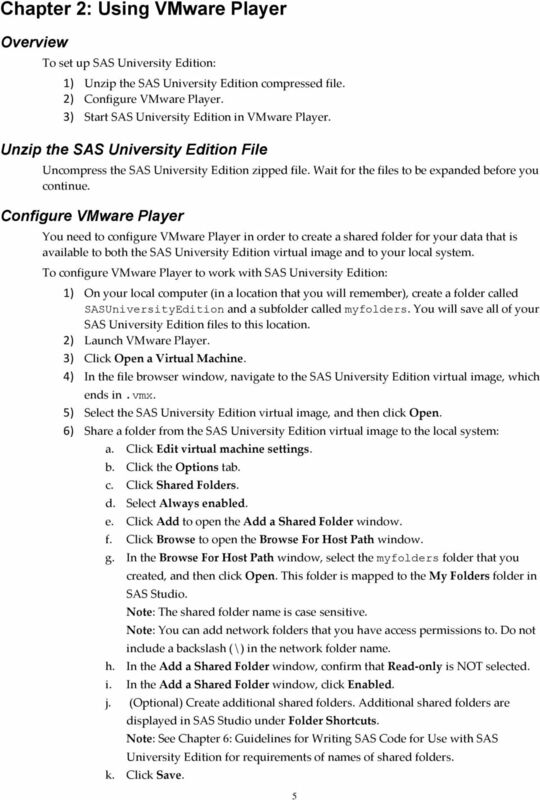 Note: If you add a shared folder to the SAS University Edition virtual image while the SAS University Edition virtual image is running, you must restart the SAS University Edition virtual image. 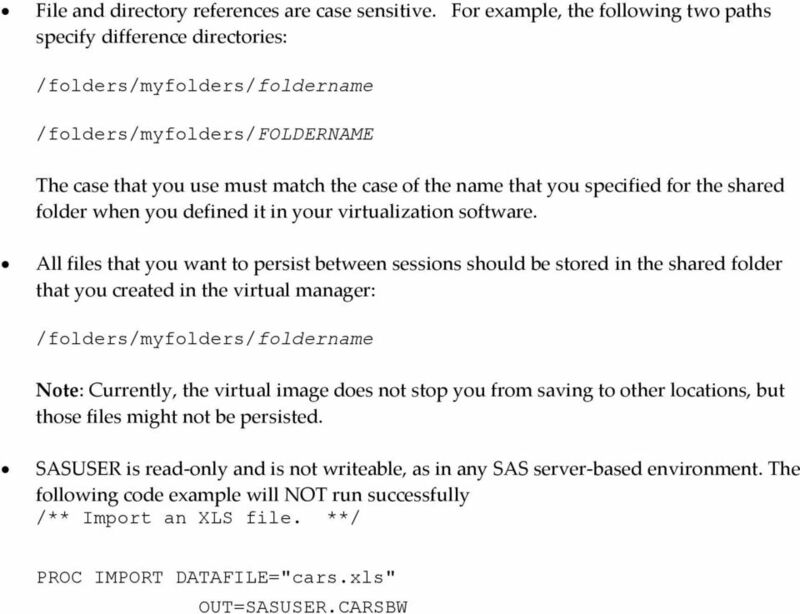 To configure VirtualBox to work with SAS University Edition: 1) On your local computer (in a location that you will remember), create a folder called SASUniversityEdition and a subfolder called myfolders. You will save all of your SAS University Edition files to this location. 2) Launch VirtualBox. 3) Select File > Import Appliance. 4) In the Import virtual appliance window, click the folder icon to the right of the field. A file browser window appears. 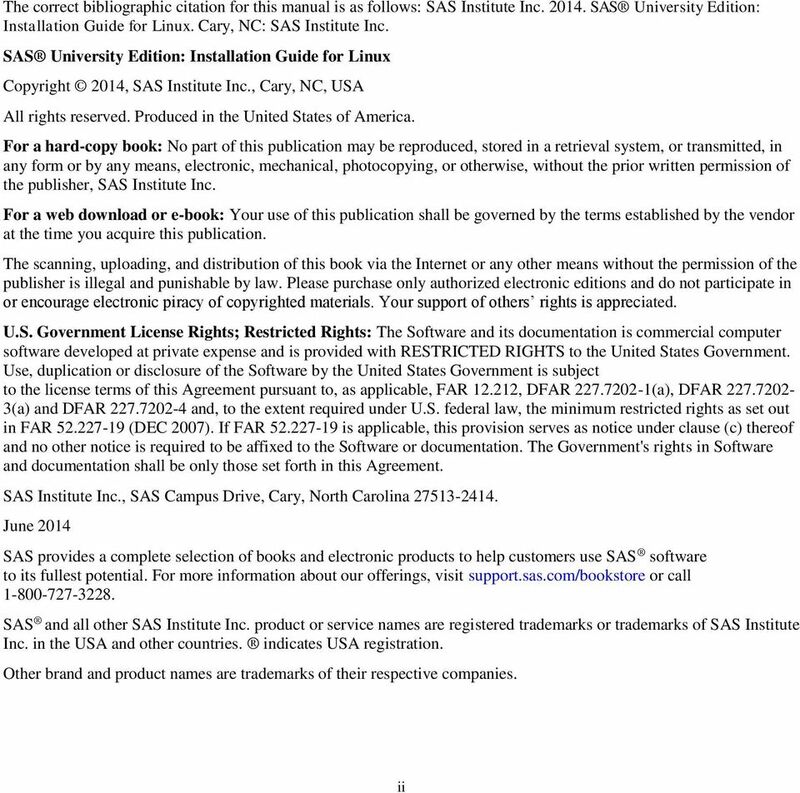 5) Select the SAS University Edition.ova file. 6) Click Open. 7) Click Next. 8) (Optional) In the Appliance settings window, edit the CPU and RAM settings. Note: The SAS University Edition virtual image is configured to use 1GB of RAM and two processors. You can increase the RAM that is assigned to the SAS University Edition virtual image, but you should assign half (50%) or less of the available physical RAM. 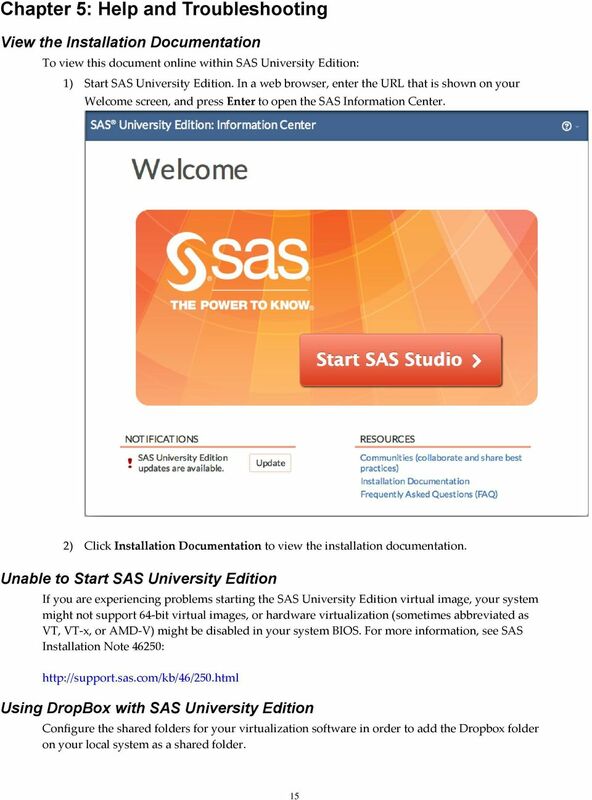 You cannot increase the number of processors that are assigned to the SAS University Edition virtual image. 9) In the Appliance settings window, click Import. The imported virtual machine is displayed in the Oracle VM VirtualBox Manager window. Note: If the message drives in use is displayed, click Ignore. 10) Select Machine > Settings. 11) In the navigation pane, click Shared Folders. 12) Click Add Shared Folders. The Add Share window appears. 13) In the Folder Path field, click the arrow and select Other. A file browser window appears. 14) Select the myfolders folder that you created, and then click Open. This folder is mapped to the My Folders folder in SAS Studio. Note: The shared folder name is case sensitive. Note: You can add network folders that you have access permissions to. Do not include a backslash (\) in the network folder name. 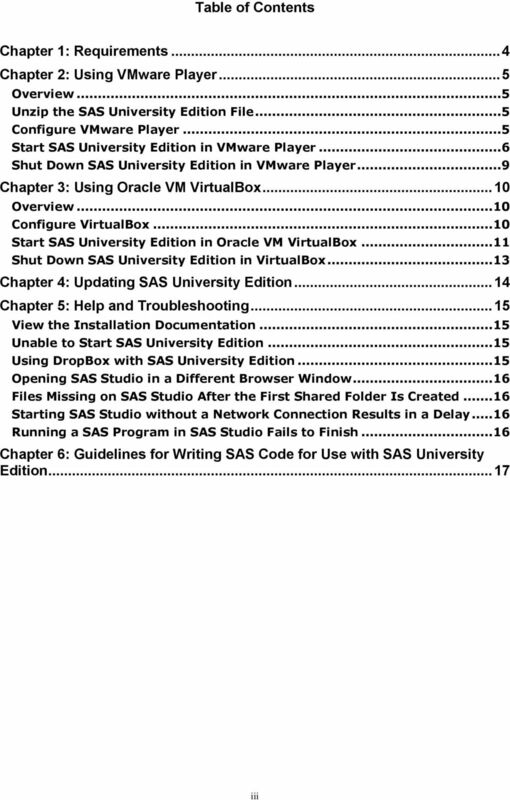 14 Chapter 4: Updating SAS University Edition You must be connected to the Internet in order to update SAS University Edition. To update SAS University Edition: 1) Start SAS University Edition. 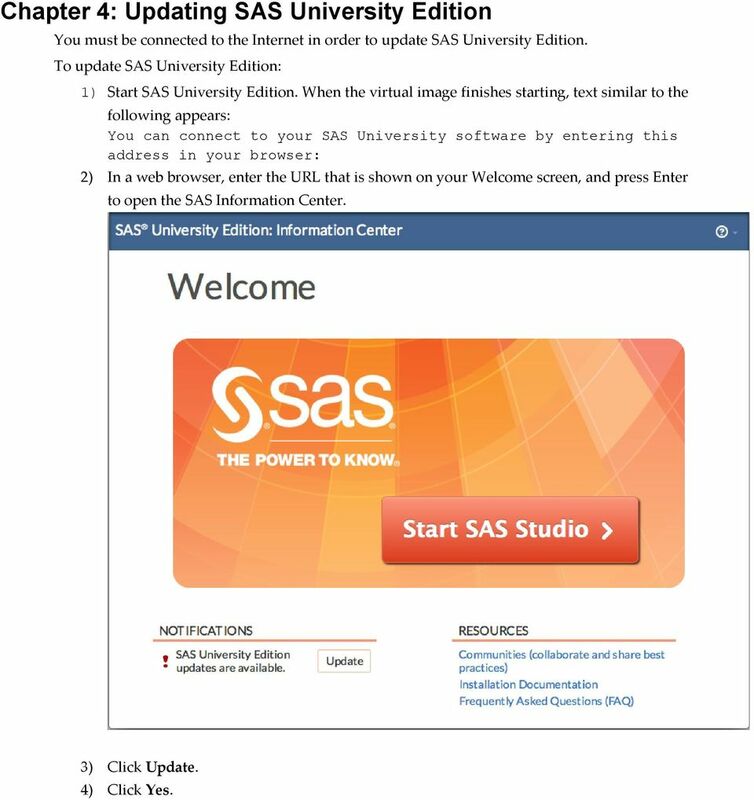 When the virtual image finishes starting, text similar to the following appears: You can connect to your SAS University software by entering this address in your browser: 2) In a web browser, enter the URL that is shown on your Welcome screen, and press Enter to open the SAS Information Center. 3) Click Update. 4) Click Yes. 16 Opening SAS Studio in a Different Browser Window If you open SAS Studio, open SAS Information Center on a new tab in the same web browser, and then click Start SAS Studio, a window appears with the following message: A SAS Studio session is already running in this browser. Would you like to close it and start a new session? 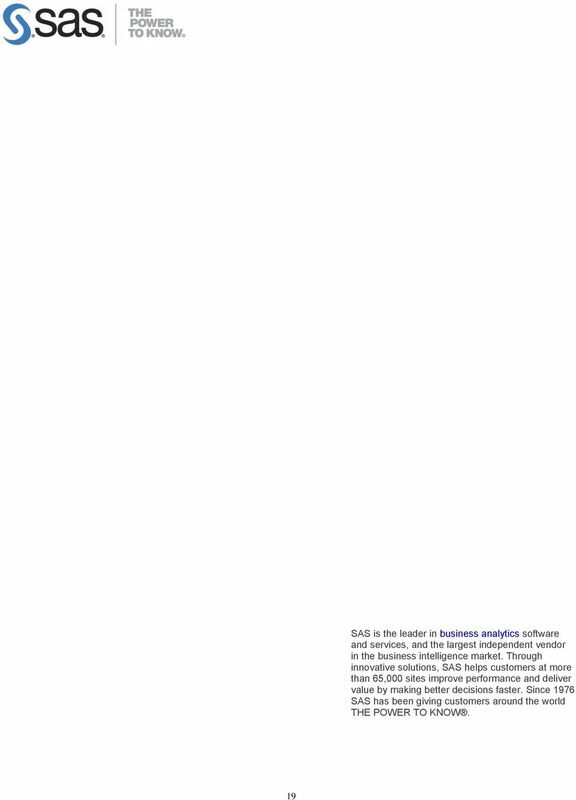 If you click Yes, your SAS Studio session opens in the current browser window. If you click No, the window displays the message again. 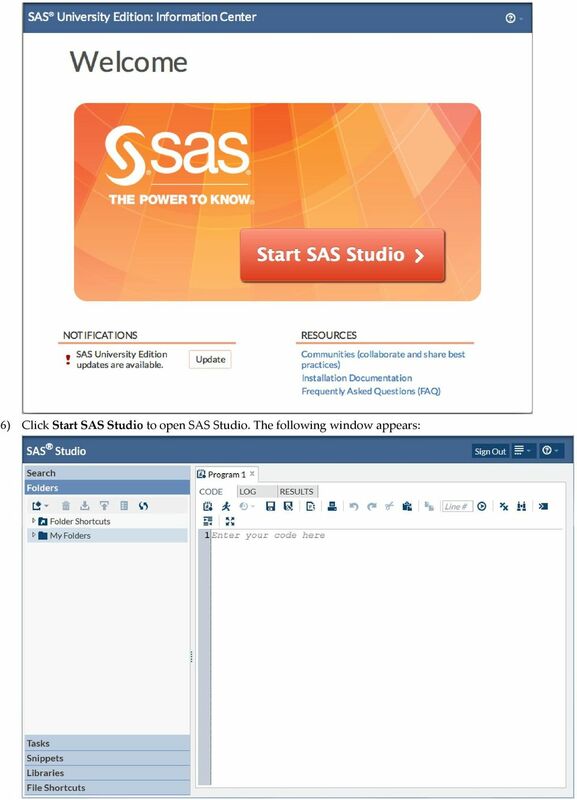 If you do not want to open SAS Studio in the current browser window, close the current browser window. 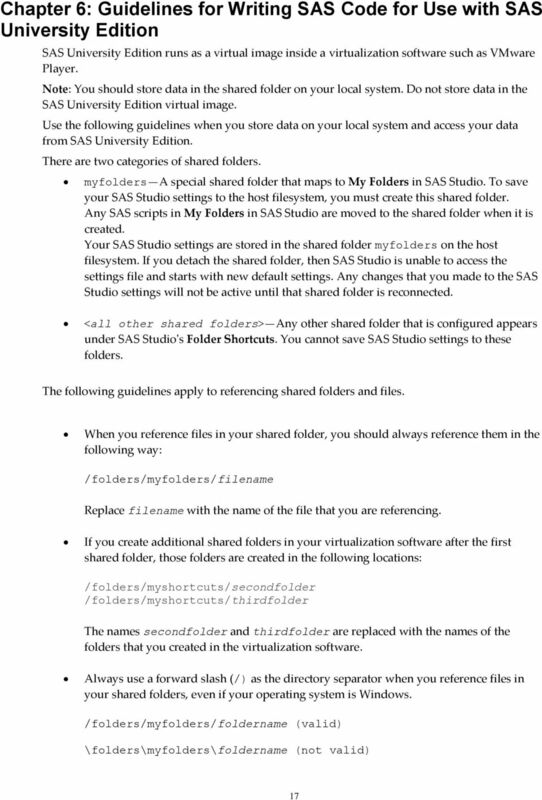 Files Missing on SAS Studio After the First Shared Folder Is Created If you start SAS Studio, create a file and save it in the default My Folders location in SAS Studio, and then create a shared folder of the default myfolders name, the existing SAS Studio My Folders is moved to the shared folder. 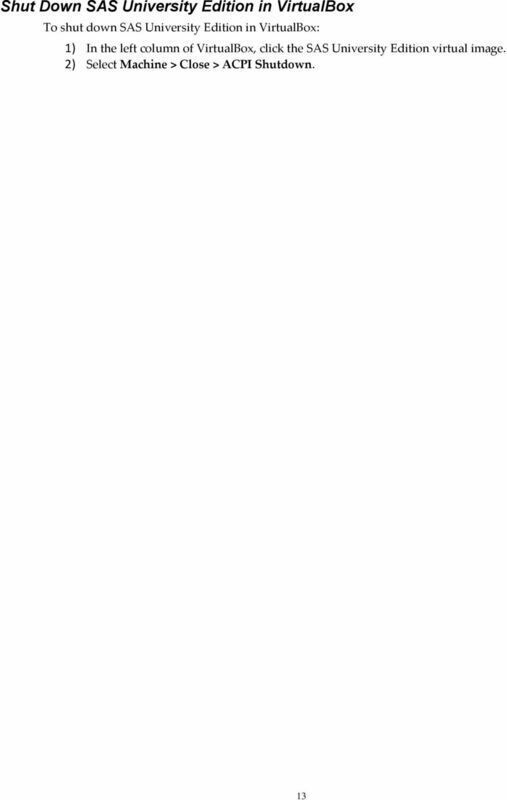 When the shared folder is created, existing files in the SAS University Edition virtual image s default folder are moved to the shared folder. If there is a name conflict when a file in the University virtual image is copied to the host operating system shared folder, then the file on the host operating system is renamed. Suppose you create Program 1 in SAS Studio, and then you create a shared folder in your virtualization software to an existing folder on the host operating system. If the folder on the host OS already contains a file named Program 1, then your SAS Studio Program 1 filename is displayed as Program 1. The host operating system s Program 1 is renamed as Program 1.~1~. Additional name collisions of the same file create Program 1.~2~ and so on. Starting SAS Studio without a Network Connection Results in a Delay If there is no network connection when you click Start SAS Studio, a long delay occurs before SAS Studio starts. 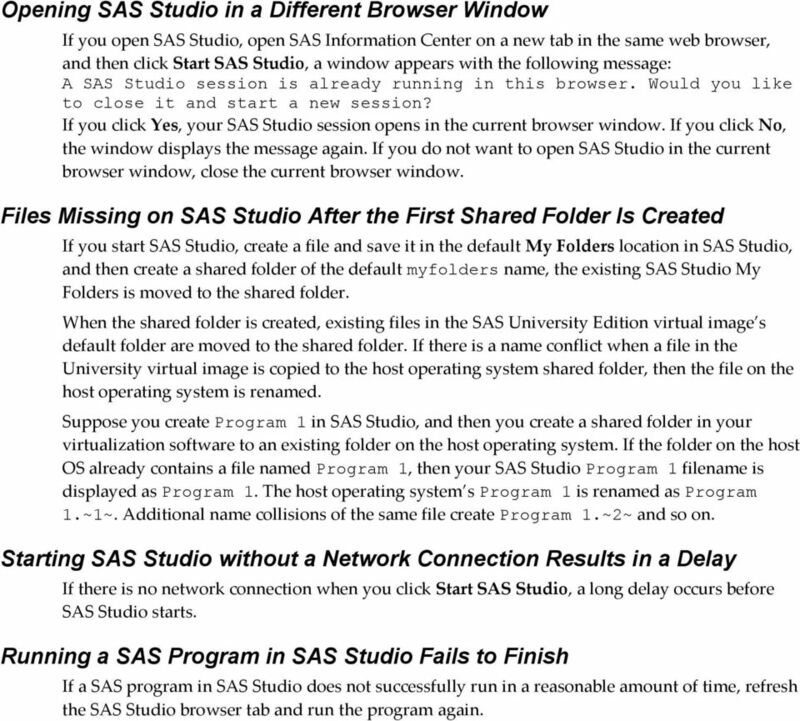 Running a SAS Program in SAS Studio Fails to Finish If a SAS program in SAS Studio does not successfully run in a reasonable amount of time, refresh the SAS Studio browser tab and run the program again. 19 19 SAS is the leader in business analytics software and services, and the largest independent vendor in the business intelligence market. Through innovative solutions, SAS helps customers at more than 65,000 sites improve performance and deliver value by making better decisions faster. Since 1976 SAS has been giving customers around the world THE POWER TO KNOW. Accessing Windows 7 in the Student Labs This document explains how to access and use Windows 7 and some of the software installed on Windows 7, such as Microsoft Office 2010, on the student lab computers.